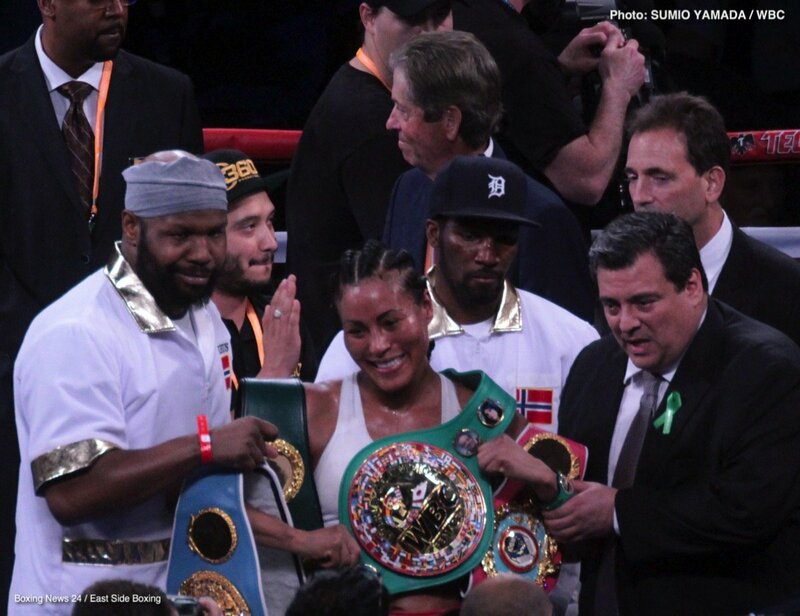 Widely regarded #1 pound for pound, welterweight champion, CECILIA BRAEKHUS entered the ring Saturday night, holding five of boxings most prestigious titles. Across the ring was Rhode Island’s own, KALI REIS, a former WBC women’s champion, using her underdog role to fuel a potential career altering victory. Before a punch was thrown on Saturday at the StubHub Center by either women, the few inches between Braekhus and Reis were historic. 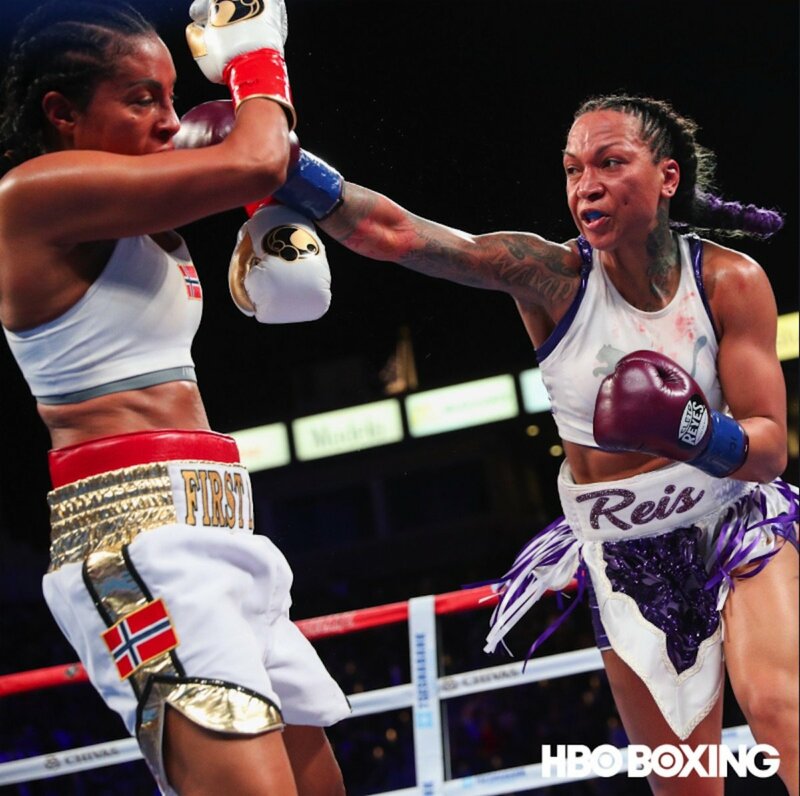 The bout will be remembered as an action packed fight from start to end, but more importantly, the first ever women’s bout televised on HBO, and it certainly did not disappoint. 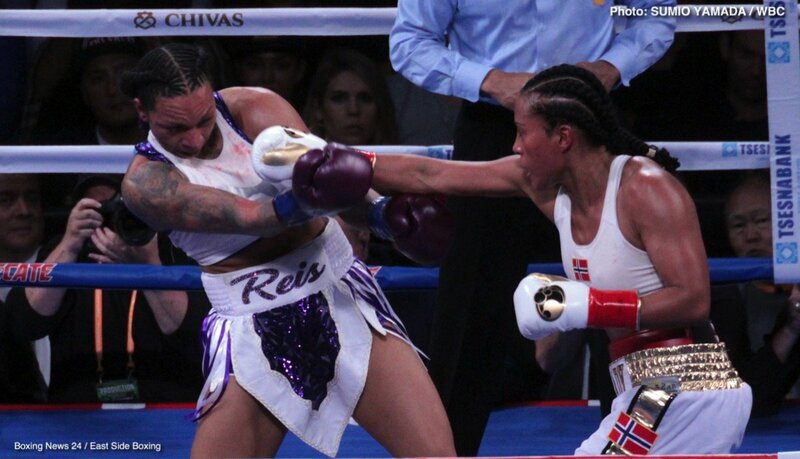 In the opening round of the ten-round championship bout, Braekhus tried to imposed her will, using a lively jab, in combination with a sharp and strong right hand to score on Reis. The early rounds were close, but it seemed that Braekhus was controlling the pace. However, in the sixth-round, Reis garnered her “Native Warrior” strength, and took matters into her own hands. After landing a sharp right hook, and straight right, Braekhus began to feel the power of Reis, which only seemed to grow stronger as the fight continued. Finally, in the seventh-round, Reis’ power proved to overwhelm Braekhus, knocking down the undefeated champion for the first time in her career; but Reis was not done yet. Later in the ninth-round, yet another right hand found a home on Braekhus’ temple, unsteadying the legs of the champion, only surviving the onslaught due to the end of the round bell. The fantastic fight went to the judges after ten-rounds, in which Braekhus outpointed Reis, by scores of 97-93 and 96-94 (2X) — to the disappointment of the fans in the StubHub Center, who let their disagreement be heard as roaring boo’s filled the stadium as the decision was announced. 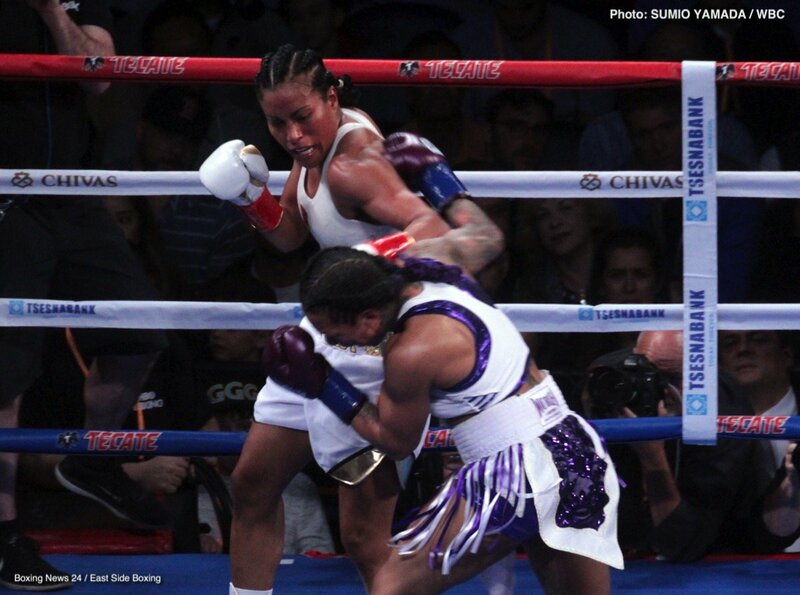 While speaking to HBO’s Max Kellerman after her unanimous decision win, Braekhus stated,”[Reis] is a top, top fighter and she gave me a tough fight.” Over roaring boo’s from the crowd who disagreed with judges scores, Cecilia said, “Yes, a rematch, a rematch for sure. Let’s do a rematch” and the boo’s turned into cheers. Saturday night proved, in front of a nationally televised audience, women mean business in the sport of boxing and Kali Reis and Cecilia Braekhus were just the right fighters to prove it. A rematch is wanted by both fighters and HBO fans, and is expected. Boxing’s only undisputed world champion CECILIA BRAEKHUS, will defend her World Female Welterweight crown against former WBC Female World Middleweight Champion KALI REIS in the co-feature of the Gennady “GGG” Golovkinvs. Vanes “The Nightmare” Martirosyan World Middleweight Championship event. Both world title bouts, featuring the No. 1 male and female pound for pound fighters in Golovkin and Braekhus, respectively, will be televised live on Cinco De Mayo, Saturday, May 5, from StubHub Center on HBO World Championship Boxing, beginning at 11:00 p.m. ET/PT. This marks the first time a women’s bout has been televised live on HBO. Braekhus (32-0, 9 KOs), a native of Cartagena, Colombia, who fights out of Bergen, Norway, is now trained by former world champion Lucia Rijker. 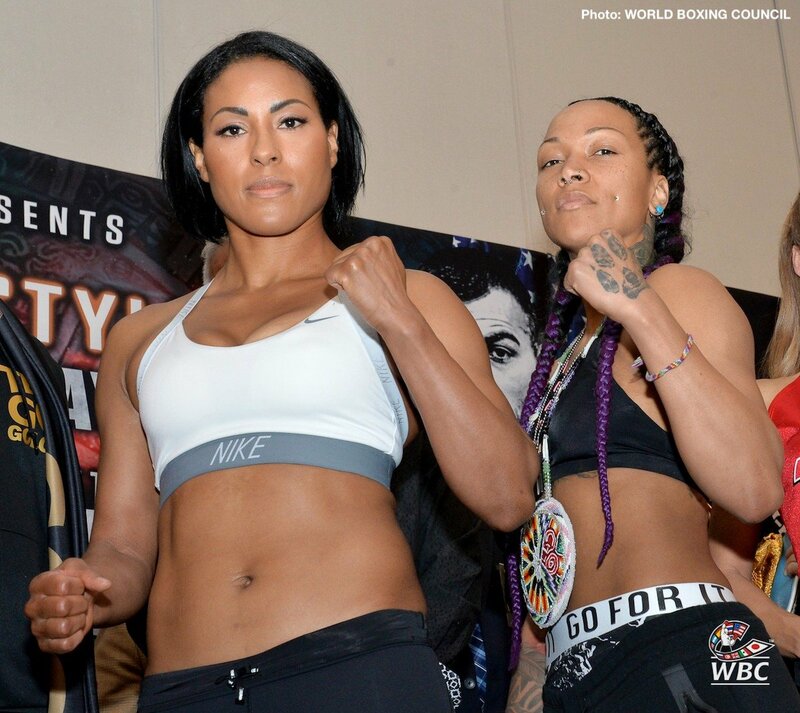 Braekhus will be looking to extend her nine-year world championship reign with her 22nd consecutive title defense, against Reis (13-6-1, 4 KOs), from Providence, RI, in a 10-round championship bout between two of the most dominant female fighters . The non-televised all-action undercard will feature undefeated consensus Top-10 world rated contender RYAN “Blue Chip” MARTIN. Martin (21-0, 12 KOs), from Chattanooga and fighting out of Cleveland, returns to Southern California for the second time this year, taking on battle-tested BREIDIS PRESCOTT (31-12, 22 KOs), a native of Colombia who fights out of Miami, Fla., in a 10-round super lightweight bout. The undercard will also feature five-time New York Golden Gloves champion and 2017 United States Amateur champion BRIAN CEBALLO (1-0, 1 KO), from Brooklyn, making his triumphant return to Southern California where he made his professional debut last month. He will be in a four-round welterweight bout. “I’m excited to showcase my skills again to the LA fans. I’m in really good shape and my weight feels great. This is going to be a special night of boxing,” said Martin. “I am going deliver the same welcome gift to Martin that I gave to Amir Khan, a two-fisted sleeping tablet,” said Prescott. Braekhus, 36, made her professional debut in 2007, and in only her 11th fight, two years later, captured the vacant WBC and WBA world female welterweight titles, winning a unanimous decision over undefeated contender Vinni Skovgaard in 2009. After two title defenses she added the vacant WBO title to her collection, winning a unanimous decision over Victoria Cisneros in 2010. In 2014, she won a unanimous decision over IBF world champion Ivana Habazin to become undisputed champion. She has reigned supreme over the welterweight division for four years and six title defenses. Due to her lobbying and popularity, the Norwegian government lifted its 33-year ban on professional boxing allowing her to defend her world championship crown four times in front of massive crowds in her homeland while becoming a national hero. On May 11, Braekhus will receive the Christy Martin Award as the Female Fighter of the Year at the annual Boxing Writers Association of America Awards Dinner in New York. Reis, 31, will be making her 2018 and West Coast debut when she challenges Braekhus. After winning IBA and UBF titles, Reis, traveled to New Zealand in 2016 and won a split decision over Maricela Cornejo to capture the vacant WBC World Female Middleweight Title. It was the first time New Zealand had ever hosted a major world championship fight. Reis enters this fight having won six of her last seven fights, the only blemish, a decision title unification loss to undefeated WBO World Female Middleweight Champion Christina Hammer. Reis is promoted by Joe DeGuardia’s Star Boxing. Martin, 25, returns to the ring after making a star turn headlining his first card, on March 27, at The Avalon in Hollywood, Calif. Martin blasted Luis Eduardo Florez in the fourth round of their 10-round bout. The Abel Sanchez-trained contender who regularly works out with Golovkin in Big Bear Lake, has a resume that boasts WBC Continental Americas lightweight title victories over Cesar Villarraga and Bryant Cruz as well as a WBA Intercontinental lightweight championship victory over Francisco Rojo despite suffering a fracture to his right hand. Martin is currently world-rated No. 6 by the IBF, No. 8 by the WBC and the WBO. .
Prescott, 34, will be the most experienced opponent Martin has faced. Best known for his first-round knockout victory of Amir Khan and a decision victory over former world champion Richar Abril, Prescott has been in tough for much of his professional career, going the distance against former two-division world champion Terence Crawford and top-rated contenders Roberto Garcia, Paul McCloskey and Fredrick Lawson. Boasting a victory by knockout ratio of 71%, Prescott will be looking to make the most of his Cinco De Mayo rumble with Martin.